We have a true passion for cross country skiing and are one of the few British companies employing professional ski instructors. 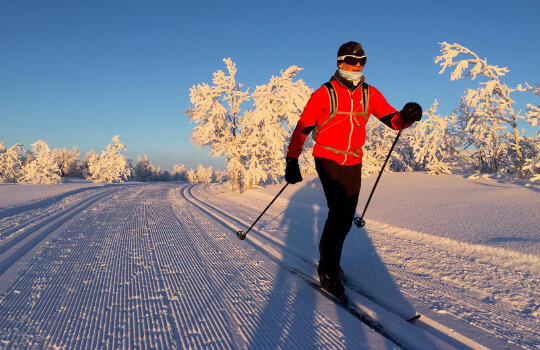 We offer cross country skiing in three styles; 'classic' which is what most people recognise as 'cross country' and resembles walking/running on skis, 'skate' which is a skating motion, and 'off track' which means skiing where there are no groomed or prepared tracks. Learn to ski in an idyllic Italian town; cobbled streets, cappuccino, and cake! Cross country skiing goes by many names such as 'nordic skiing', 'langlauf', 'ski de fond', 'telemark', etc. Most of our trips are 'classic' involving a running/walking motion, we have several 'skate' trips, and we also offer 'off track' touring which is away from prepared ski tracks and in remoter areas. With all of these disciplines 'ski lifts' are not used and it is your own efforts which propel you across the landscape. For an understanding of the disciplines please refer to our Frequently Asked Questions. On our trips you will have first class instructors who ensure that learning is fun. The emphasis on excellent instruction is perhaps no surprise as both our co-founders hold the highest cross country ski qualification awarded by the International Ski Instructors Association. Simply choose the trip which most suits your experience, expectations and level of fitness and we will do the rest. We have introduced children as young as 8 to the sport, and encouraged octogenarians who have dreamed of a ski journey across the Norwegian wilderness. Many of our previous 'beginners' are now joining us on long distance ski journeys. It is a joy to witness! The gorgeous Obergoms Valley in Switzerland has just got to be the best for improving your 'skate' ski technique. Wide trails, lots of flat terrain, sunny, and with lots of coffee stop potential. In addition, you have a train to take the strain. Perfect week for those who have always wanted to master 'skating'. The perfect winter break for those who have 'tried' cross country skiing and who now want to improve. Excellent spa hotel, delicious Italian coffee, and wonderful ski tracks. Cogne offers first class cross country skiing making it the perfect location to develop your ski technique on 'skinny' skis. This trip is a 'combination' of our two long-weekend winter holidays. Our Italian Ski Break in the stunning valley of Cogne, and our Snowshoe Long Weekend, based in the world famous Chamonix Valley, France. These trips are aimed as introductions to cross country skiing and snowshoeing, both fabulous ways to explore the winter wonderland and activities which are steadily increasing their following. Go on have a go!